Hoveizeh, Iran’s new cruise missile, is shown during an exhibition in the capital Tehran on February 2. Iran successfully test-launched a new domestically made, long-range cruise missile on February 2. The test, held on the 40th anniversary of the Islamic Revolution, indicates that Iran remains resilient in its missile development, despite heavy sanctions by the United States. According to Hatami, the missile “flies at a very low altitude” and “can be ready in the shortest possible time,” making it easy to deploy. A 37-second video from the Iranian government shows the successful launch multiple times from different angles and the missile striking its test target somewhere in the desert. The surface-to-surface cruise missile was manufactured by the Iranian Defense Ministry’s Aerospace Industries Organization. 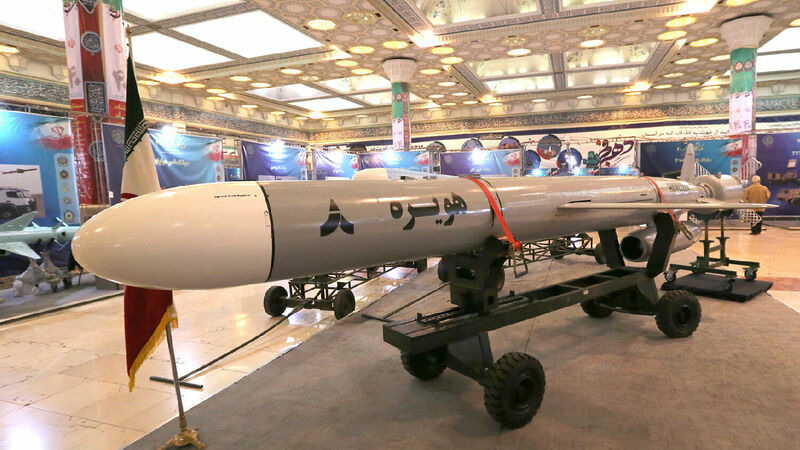 At the unveiling ceremony on February 2, Hatami said that the cruise missile is part of the Soumar missiles, which Iran added to its arsenal in 2015. The Soumar missile is derived from the Russian Kh-55, which is capable of carrying a nuclear warhead. On Sunday, an unsourced report by Iran’s Fars News Agency said the nation added new precision-guided warheads to its longest-range ballistic missile. “The new generation of missiles with guided warheads has been named Khoramshahr 2, and they can be controlled until hitting the target and are able to carry warheads weighing nearly 2 tons,” according to the report. Iran says the Khoramshahr 2 missile was designed to carry conventional warheads only and has limited its range to a maximum of 1,250 miles (2,000 kilometers), but it also claims the technology could allow the missile to travel much further. Either way, Israel lies well within the missile’s range. In January, Iran attempted to launch a satellite into low-Earth orbit using domestically manufactured rockets. Though the attempt failed, it showed the world that Iran has no intention of slowing down its progress. Iran could use similar technology to develop an intercontinental ballistic missile capable of striking targets as far away as 6,200 miles (10,000 kilometers). The United States says Iran’s ballistic missile development program violates a United Nations Security Council resolution. Iran denies the claim that it is seeking to develop a nuclear warhead, stating that its ballistic missile program is for self-defense only. Meanwhile, Iranian leaders have continued openly threatening Israel. For more information on Iran’s desire to destroy Israel, listen to the podcast below. Our modern, sophisticated, enlightened societies like to believe that we have evolved way past the time of nations being hell-bent on the destruction of others. However, what we are witnessing in the north of Israel is Iran’s manifest desire to do just that. Iran is extremely radical—the king over radical Islam. Where is this nation’s pushiness leading? To war! Just as it has in the past. It’s leading to terrifying war with weapons of mass destruction. It can lead no place else. Iran will continue pushing its missile testing forward, and it gives no indication of stopping. Rather, Iranian officials have said Iran “will not hesitate to strengthen its military capabilities, including its missile power.” Over the past six months, Iran successfully attacked a Kurdish meeting in Iraq and an Islamic State enclave in Syria, launched a medium-range ballistic missile capable of carrying multiple warheads, and launched a missile at an Israeli ski resort in the Golan Heights. Iran has shown it will not back down, despite having its vital oil, gas and shipping sectors heavily sanctioned by the U.S. since November. Watch for Iran to continue pushing its missile development as a means of achieving regional superiority in the Middle East.